Parking may be a bit easier for students who live on campus, as an additional parking lot is being added to the area near The Village. The 300-space lot will be designated for students for students with “R” permits. However, this project is more than adding a parking lot. According to Aaron Nichols, the assistant director of communications in Administrative Services, this construction is a part of a larger project that will include adding another entrance to campus off of Fletcher Ave.
Nichols added that the project will also include a roundabout that will connect to Maple Drive and an extension of Laurel Drive near the south side of the on-campus Publix. The total amount of land used for this project is more than 13 acres, according to Nichols. Nichols said that the initial phase of these plans, specifically the designs, began in early 2016 and will be complete in August for the start of the fall semester. Anthony Gifford, a former Summit resident, said that he used to spend a lot of time finding a parking space. Now, with these additions, he said that he believes parking will be a simpler process for students who live on campus. Ashley Paytas is a Holly A resident who said parking is a “pain,” in part because she feels residents of The Village take some of the spaces in the Cresent Hill garage and in Lot 17 -- near Argos Exchange -- where she most often parks. “More parking would help because spatially USF just expected everyone in The Village to migrate and take up room in other parking,” Patas said. The Board of Trustees first approved an initial budgetary amount of roughly $6 million for this project in May of 2018, though the university only funds approximately half of this amount. The other portion which amounts to $3,275,000 is funded by the developers of The Village, Capstone-Harrison Street, LLC. All aspects of the project have been funded, with the exception of the roundabout near Maple Drive, according to Nichols. Alex Kahn, a senior majoring in communication, commented that he thinks more than an additional lot will be needed to improve congestion and trouble finding a parking space. “Why not a garage? We need more parking, and it's more space efficient at solving the problem at hand,” Kahn said. Patricia Vega, a junior majoring in international studies, shared a similar sentiment. She parks in the park and ride lots with her “Y” permit, but because of where they are located it takes her a while to get to her destination. Nichols said that the project includes five points that he believes will be improved following its completion. Of those, is reducing the congestion that high-traffic areas often face, specifically at the intersection of Palm Drive and Fletcher Ave. 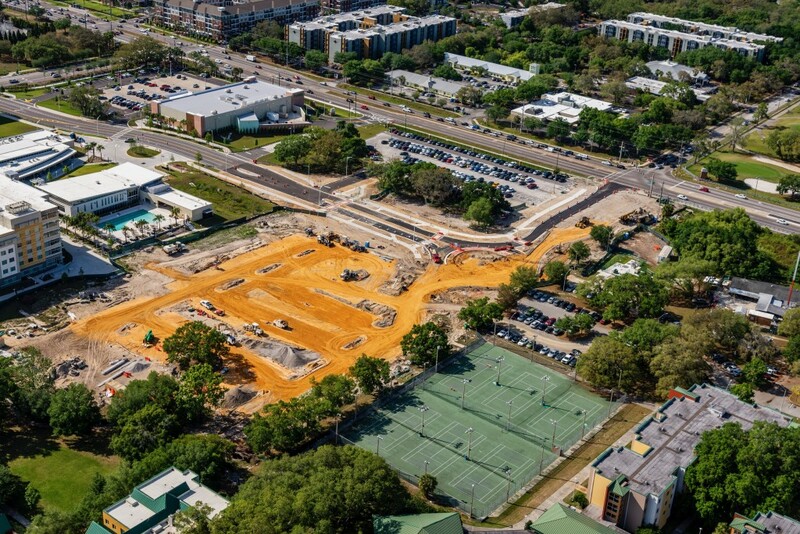 It will create more accessible parking spaces with closer proximity to the residence halls for students who live on campus, will improve spaces for those riding in bike lanes and pedestrian walkways and improve access to Publix, The FIT and The Hub. “(The project will aid in) enhancing the university experience with well-designed, updated infrastructure -- the project includes upgraded sewer piping and a lift station, roadway and parking lot lighting, sidewalks and landscaping,” Nichols said.